SLIS alumnus, Dr. Christopher Shaffer, may be a Troy Trojan today, but his career in Library and Information began in Tuscaloosa at UA SLIS. 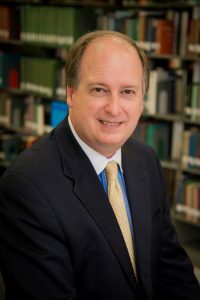 Drawing upon his diverse educational experiences as an international teacher, college professor, and academic librarian, Dr. Shaffer currently serves as Dean of University Libraries at Troy University. He received his BA in History from Auburn University in 1991, and earned a certificate to teach in Georgia. Before starting his career in the U.S., he chose to teach in Slovakia for a half year as an English teacher. Over the next several years stateside, Shaffer taught at the middle and high school level, with a return trip for 6 months to Slovakia, where he again taught English. During his time as a teacher, Dr. Shaffer also went back to graduate school for degrees in Social Studies Education and Administration. His wife, Amber, is also an educator, teaching high school English and the Shaffers have two dogs, Max and Dolly. By 2004, Shaffer decided that he was ready to leave the classroom and enrolled in SLIS. Shaffer was hired immediately upon graduation by Troy University and after a year at Troy, he was named interim director of the Dothan Campus library, which became a permanent appointment the following year. Under Shaffer’s leadership, library systems on the Dothan Campus were made consistent with other University libraries. Shaffer also spearheaded a highly successful grant writing campaign that expanded the scope and programs offered at the Dothan Campus Library, culminating with the Troy University Dothan Library receiving the 2014 Alabama Library Association’s Humanitarian Award. Christopher Shaffer has transformed the Troy University libraries by bringing in programs that have opened a window to a much larger world to the students living in this segment of rural southeastern Alabama. His efforts were recognized in 2015 when he was awarded the I Love My Librarian Award, given by the Carnegie Corporation, New York Times, ALA, and NYPL. http://www.ilovelibraries.org/article/i-love-my-librarian-award-winner-dr-christopher-shaffer.